Telugu Fine Arts Society (TFAS) Inc. was organized in 1984 as a corporation under and by virtue of N.J.S. 15A:1-1 et seq., the "New Jersey Nonprofit Corporation Act." Telugu is a language spoken by 80 million people in the state of Andhra Pradesh in South India. The purposes for which TFAS was organized are listed under Article III of the Constitution and By Laws. To foster, promote and encourage the language of Telugu and literature in the language of Telugu. To promote and encourage arts and cultural activities of Telugu speaking people. To preserve and propagate Telugu cultural heritage amongst future generations by exchange of cultural ambassadors between North America and other countries including India. Nine Trustees are elected by TFAS members every two years. These members elect President, Vice President, Secretary, Treasurer and five Committee chairs (current committees: Annual Events, Membership Services, IT Services & Special Projects, Community Affairs, and Youth Affairs) to meet and make decisions related to activities and finances of the association. The committee concept allows volunteer members to join and contribute to the committee activities. 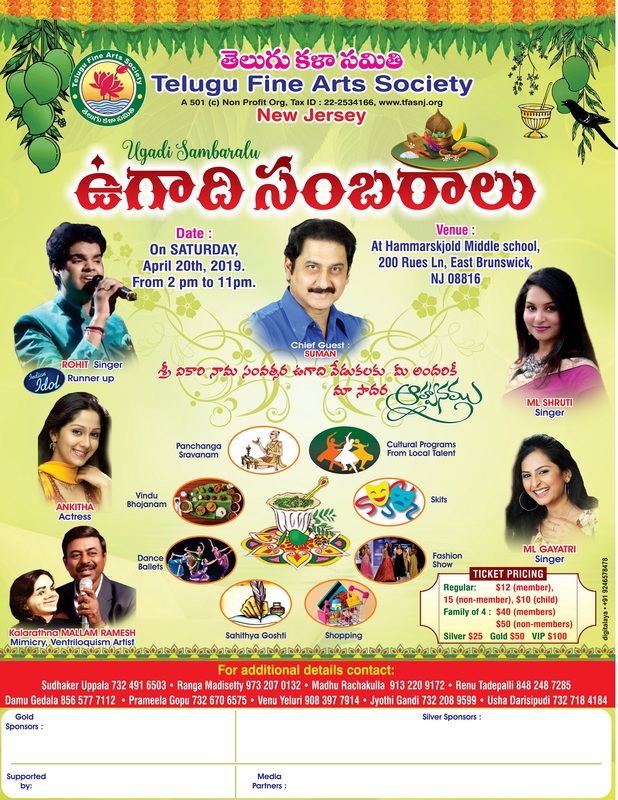 We celebrate Ugadi (Telugu new year based on lunar calendar) and Deepavali (Indian festival of lights) with music, dance and stage plays, with the participation of children, and of course, with good Telugu food. Each year, we celebrate Sangeetha Murthy day in honor of Thyagaraja, Syama Sastry, and Muthuswamy Dikshitar who were composers of Carnatic (South Indian classical) music born in the 18th century. Almost one hundred children and adults participate in this program and sing or play an instrument individually or as small groups a composition by these great composers. In 1990, we developed a cultural exhibit with information and pictures on Telugu history, art, music, and literature and exhibited at TFAS functions and at Telugu Association of North America (TANA) conferences at Atlanta in 1991 and in New York in 1993. In addition, we sponsor limited number of national tours of artists from India. "Mandolin" Srinivas, actors - Gollapudi Maruthi Rao, J.V. Somayajulu, et al, Vamsee Ramaraju and troop, "Whistle Wizard" Sivaprasad, Kala Krishna, and Dwaram group are some examples. We publish Telugu Jyothi monthly with readers in US, Canada, and India. We conduct short Telugu story competitions in India starting in 1984, and every year since, through Andhra Jyothi Weekly. We started cartoon competitions as well. Contributions from US, Canadian, and Indian writers have increased recently. The magazine also serves as a communication vehicle among the Trustees and members. The magazine became more attractive with computerized Telugu script in 1991. Community, Youth, and Philanthropic Services We include in Telugu Jyothi, matrimonial column, topics on cultural gap issues, articles on financial and insurance advice, facilitation of donations for the needy and worthy causes. During 1993-94 period, the middle four pages of Telugu Jyothi, "A Step in the Right Direction," were devoted to youth. A few enthusiastic youth members managed this section to address topics and concerns of interest to them. An award is donated annually by our Life Members Dr. K.V. Rao - Jyothi Rao to recognize an outstanding person from India as selected by the Raja Lakshmi Foundation of Madras. TFAS members have been contributing to the Raja Lakshmi literary award since 1993. "Guruvunu Gurthinchandi" - Best Teacher award by R.K.Jonnada, is being given since 1997. Other members have also donated funds towards this award. In addition, we recognize our members for their outstanding service to the association. In 1993, we gave awards to youth for service to TFAS or community in general. Over the years, TFAS invited and honored more than 50 artists, writers, educators and politicians. who were visiting from India. Meeting these celebrities from India has been a great tradition and opportunity for TFAS members. We certainly believe so, and here are the reasons: Most members are busy people with several personal and professional commitments. However, they get involved in the TFAS activities as Trustees or volunteers. The involvement includes publicity and organization of functions, planning the cultural program, and contribution of articles to and typing for Telugu Jyothi. These activities provide a sense of achievement for families. But the true measure of TFAS success we believe, is reflected in what our children -- the second generation -- get out of the involvement in TFAS. They eventually become Indian ambassadors in colleges organizing Indian cultural programs. They write articles discussing cultural and career issues in Telugu Jyothi and TANA magazine. They get married going through traditional ceremony with full appreciation of our culture. They make trips to India thoroughly enjoying and appreciating the culture and people there. We probably cannot prove directly, but all this must have something to do with our involvement with TFAS and the community in general. TFAS encourages new settlers in the United States from India to take active part in TFAS (or any other cultural association) at least for the sake of their younger children. Obviously there are no guarantees but there is a very high chance that the exposure to any cultural activities would help our second generation maintain pride of their heritage and face the complexities of the future life with confidence. If any of you would like to get involved in the community in any way, please explore the use of the TFAS infrastructure. We have an excellent team of Trustees and they are ready to work with you.